Universal CPE (uCPE) is an industry hot topic as it brings more flexibility in the subscription and deployment of value-added services for end-customers through virtualization. It consists of a single platform running virtual network functions (VNFs) to replace multiple dedicated appliances. The hardware is built using commercial off-the-shelf (COTS) servers, which brings another strong advantage in the global sourcing capabilities of a unique or commonly used hardware platform. This question is valid because network intensive tasks are required for the uCPE including switching between VNFs at the host level. When VNFs are chained, more switching operations are needed. Additionally, performance must be deterministic to avoid facing temporary issues that will be difficult to analyze and troubleshoot. The price for all-in-one uCPE appliances is very sensitive, and a Telecom Equipment Manufacturer (TEM) starting in the uCPE business cannot afford to build its solution on a platform that won’t match Service Provider’s TCO expectations. I have personally been involved in many of these discussions with TEMs, and understand how critical it is to have the most efficient switching/routing stack to keep the best possible price/performance ratio to be competitive on this market. Routing is a must-have feature for uCPE. Some TEMs, to optimize the design, take the decision to embed the mandatory vRouter directly in the infrastructure. It has multiple advantages, such as avoiding additional switching operations from/to a dedicated vRouter VNF, but also properly managing end-to-end Quality of Service (QoS) in case congestion happens during the VNF chain. TEMs may also want to add a low-cost physical CPE design, without virtualization capabilities, based on the same architecture, routing software and management. 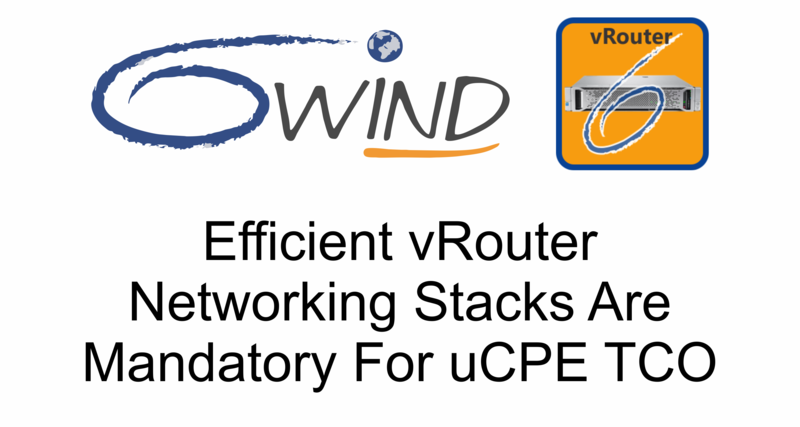 This blog post will detail a test that compares the efficiency of a Linux networking stack versus 6WIND’s vRouter stack for uCPE solutions. The test goal is to determine the routing capability of a single Atom C2000 CPU core in a uCPE use case to understand the savings brought by an efficient fast path stack versus Linux. No VNFs are used in this test for the sake of simplicity. 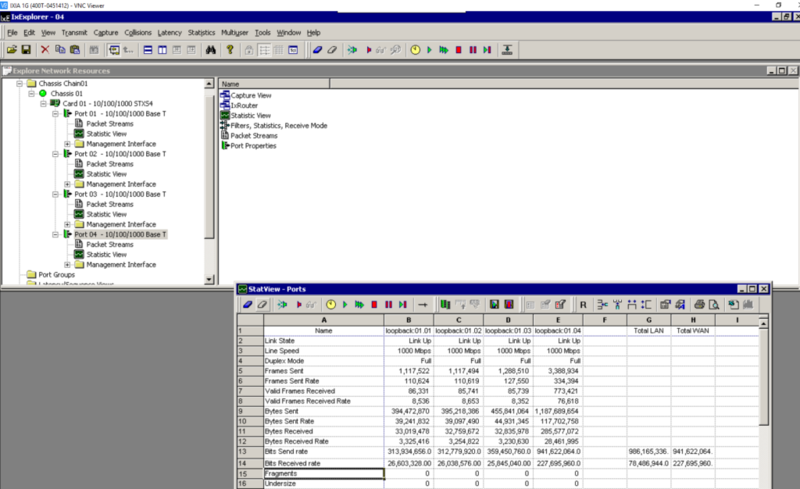 The main goal was to showcase a low-cost CPE design based on a COTS server. Please note 6WIND’s vRouter is fully able to combine switching features (by offloading Linux Bridge or Open vSwitch data plane from the kernel) with routing. After the test, we will conclude that 6WIND vRouter is 7X Linux performance for uCPE. 6WIND’s networking stack is designed as an acceleration engine for the Linux networking stack, offloading network processing from the Linux stack into what we refer to as our fast path. 6WIND’s fast path runs on a dedicated set of cores (only one in this example). It has very limited impact on the system’s management. Standard Linux commands will be used to configure networking, and we demonstrate that our fast path properly reflects Linux networking stack states. The advantages of such design for uCPE are huge, and summarized below. One of the drawbacks with other projects such as OVS-DPDK or VPP is that they are designed as standalone stacks. This makes it very complex to mix Ethernet interfaces natively managed by those technologies with LTE or USB interfaces that may not be usable with those stacks. 6WIND’s vRouter natively supports this mix by design. Three 1Gbps ports are used as LAN ports, while a single 1Gbps port is used for WAN. These 4x1Gbps ports are connected to an IXIA to generate the traffic and measure the performance. 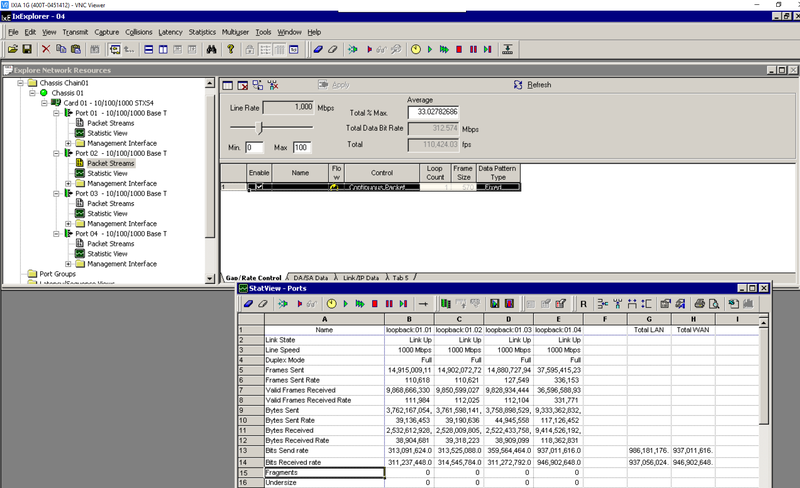 I am then sending the return traffic, from WAN to LAN @ 1Gbps with iMIX packets. Using 6WIND’s vRouter networking stack, I was able to sustain the 1Gbps bi-directional with IMIX traffic and all features enabled on 1 single core. It is interesting to understand how fast 6WIND’s vRouter is compared to Linux. Thus, the same test was done by stopping 6WIND’s fast path, and still using a single core to perform the network processing. For this, I pinned all network IRQs to the same core that the fast path was previously using. The result is totally different: out of the 2Gbps sent by the IXIA, only 300Mbps is successfully processed by Linux, while the 6WIND fast path was able to sustain the full 2Gbps. The first conclusion of our benchmark is that without an efficient networking stack the number of COTS server cores needed to sustain the target performance for uCPE appliances may be too high for the targeted TCO. 6WIND’s vRouter networking stack, as demonstrated in this benchmark, allows customers to pick an entry level 2 core CPU to build a physical CPE with good performance, while a 4 core CPU running a Linux stack wouldn’t even be close to the same performance. When adding VNFs, the efficiency of the host routing stack will be even more important, as additional switching operations from/to the VNFs will be combined with routing. Thus, the CPU cycles saved by the efficient routing stack will save more compute for the VNFs themselves. If you are designing a uCPE solution and looking to increase performance while saving costs, contact us today to request an evaluation of 6WIND vRouter. Nicolas Harnois is Pre-sales Manager at 6WIND.